Ekiti State High Court will no longer host the Ekiti State Governorship Election Petition Tribunal – this was due to security scare yesterday. The tribunal shifted its sitting to another venue, possibly Abuja. 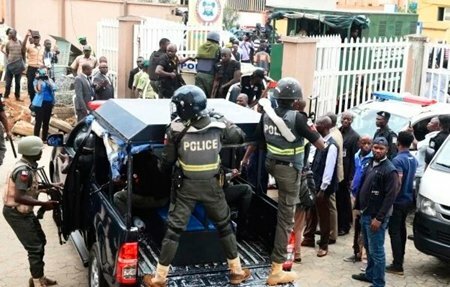 The police fired shots into the air at about 2.20 pm to disperse party supporters after the tribunal had ruled that it was moving its operations from Ado-Ekiti. The drama happened on the first day of the hearing of the petition filed by the People’s Democratic Party (PDP) governorship candidate, Prof. Kolapo Olusola, against the election of Dr. Kayode Fayemi, who ran on the platform of the All Progressives Congress (APC). Fayemi won the July 14 governorship election, polling 197,459 to defeat Olusola, who got 178,122 votes. The tribunal ordered a change of venue following the oral application by counsel to the petitioners, which was supported by counsel to all respondents in the matter. The panel, which is chaired by Justice Sulaiman Belgore, found merit in the application and ordered a shift of venue. The tribunal chair said the new venue will be communicated to parties within 48 hours. The dramatic change of venue stalled the pre-trial hearing which was supposed to be the first assignment of the panel. The 1st Petitioner, PDP and Olusola, the 2nd Petitioner were represented by Mr. Adebayo Adelodun (SAN). The 1st Respondent, the Independent National Electoral Commission (INEC), was represented by Mr. Charles Edosomwan, 2nd Respondent, APC, by Chief Akinlolu Olujinmi (SAN) and the 3rd Respondent, Dr. Fayemi, was represented by Prince Lateef Fagbemi (SAN). Members of the APC and the PDP had massed outside the court complex for a “show of force” as early as 7.30am. The sitting was supposed to begin at 9.00am. Many of the party members carried canes, sticks and cudgels. They attempted to enter the court premises but were restricted. Lawyers to all parties raised concerns on their safety and that of witnesses expected to give evidence at the tribunal. They called for the shift of the hearing to Abuja, the nation’s capital. The request was made after the three-man panel led by Justice Belgore had emerged from the chambers at 11.30am after the inaugural sitting, which started at 10.12am and ended at 10.32am. Other members of the panel are Justice Ebiyerin Umukoro and Justice Aliyu Baba Usman. There were allegations by some PDP members that they were attacked by APC supporters outside the court complex. Two House of Assembly members, Dayo Akinleye and Samuel Omotoso, alleged that they were assaulted by people they described as “APC thugs” who massed under the flyover directly opposite the court premises. Adelodun, who described the atmosphere outside the court as “scary and alarming”, told the panel that the petitioners’ lawyers were held up for several minutes on their way to the court. He said they were allowed entry following the intervention of a senior police officer. The presence of crowd will not allow them to do their jobs as freely as possible, Adelodun said. He called for the shift of the proceedings to Abuja in view of the alleged security threat posed to them.